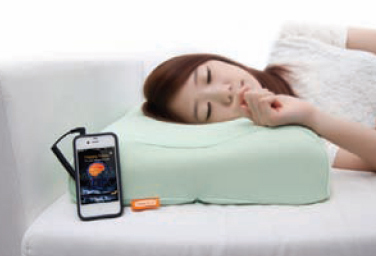 Happy Sleep Original Pillow makes it possible to hear binaural beat effectively through the bone conduction transducer that delivers the sound by changing the electric signal to vibrating signal in a bone conducting method of the bone conduction speaker. It also induces the necessary brain wave required to maintain the best condition for achieving the optimum level of sleep. Users can listen to various applications, such as the music, language lessens, audio books and religious words, from the pillow through the bone conduction speaker. The pillow uses science of sound sleep and concept of bone conduction in which the sound is conducted to skull to be directly delivered to inner ear without going through eardrum. By using bone conducting speaker, deafness from excessive use of earphone can be prevented. Also it does not interfere seat mates while sleeping because the sound is not heard by anyone else. Bone Conduction Transducer is attached to the bone conduction speaker, which works as a vibrating speaker that delivers the sound after changing the electric signal to vibrating signal. Stick the bone conduction speaker to the occipital area in the back of the head to hear the vibrating binaural beat effectively. It’s a high-tech design that supports cervical vertebral, lessens the burden of the neck by dispersing the pressure of the head and helps having a stable sleep. Happy Sleep happysleep.co.kr is a brand owned by rabiotech Co., Ltd. that develops and manufactures the products that helps improving the quality of life and making a healthy life by grafting health onto sleep. If you want more information about ‘Pillow’, please korean-products.com/about-us/contact-us. Hello. Thank you for telling me about this problems. I’ll check it. When I originally commented I clicked the -Notify me when new comments are added- checkbox and now each and every time a comment is added I get four emails with the identical comment. Is there any way you’re able to get rid of me from that service? Thanks!